Between Iberville &amp; Bienville on Chartres St. There are many parking lots located within close proximity to Justine, with the closest being at the Hotel Monteleone. We also recommend taking Uber/Lyft to avoid the French Quarter traffic, depending on what's going on in the French Quarter. Close to the streetcar line stop at Canal & Carondelet St.
Robby is the best! He is fantastic! And the food is exquisite. I would highly recommend the burger...the best I have had. What a beautiful place. 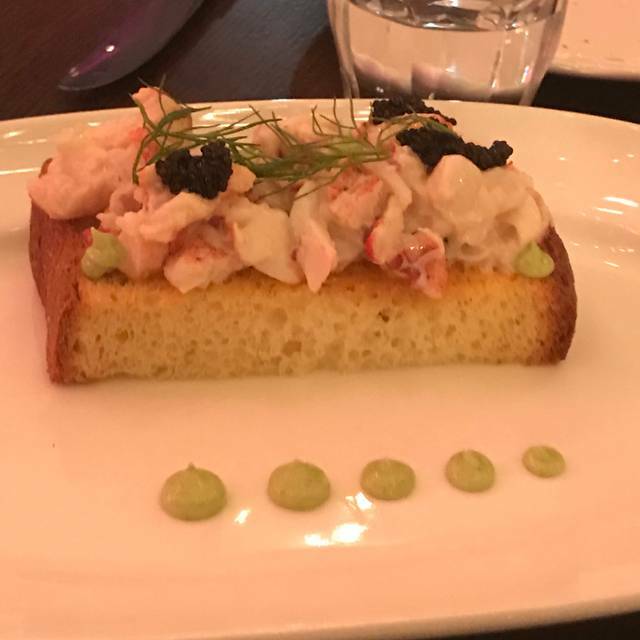 Just a wonderful meal and experience. Will definitely be back! Interesting menu, nice location on the street. Nicoise salad was strange - wilted lettuce and not Ahi tuna. Manager took it off the bill. Waitress was attentive at first, then couldn't be found. Had to chase down waitress to handle our food complaint and to get the bill. Manager was accommodating and kind. Main dish (fresh gulf fish with toasted almonds in butter sauce) was delicious and unique. All said, I would not return. I wanted more; however the experience fell short. Chic, yet accessible spot for lunch or dinner. Food is great. Decor is amazing. Drinks are unique. Perfect for a date or everyday lunch with friends. Food is overpriced and not good. We got the French onion soup( broth needs to be richer) lobster tartine (odd dish, just lobster on top some dry bread), chicken paillard (dry and bland) shrimp in a bag with artichokes (the 4 shrimp were undercooked and flavorless and there were no artichokes to be seen) and petite filet (came out raw with the peppercorn sauce cold so has to be sent back). The best part of the meal was the salad which is literally just lettuce and dressing. The dressing was tasty. The waitress was sweet but we had to ask for everything we needed such as side dishes, salt and pepper, more drinks (which my the way our apps came out before we even got our drinks). Overall disappointing. But the atmosphere is the sweet waitress were the positives. 2) nothing wrong with the waiter but there must be some kind of miscommunication between him and the kitchen. We wait over an hour and left after that when our appetizers didn’t come. All we got was bread. 3) waiter asked for our number and name. I was expected to be contacted and apologized for the ridiculous serving time. Never got contacted. This is what I’m most mad annoyed about. Overall disappointed that I didn’t get to try the food and this happened. This is a fairly new restaurant and it’s in the quarter competing with other great restaurants, I was expecting much more than what happened to us. I expect if a restaurant wants to come off as fine dining French then it should act like so. We are 2 locals who could have enjoyed the food and be returning customers so this is disappointing overall. What a fun experience! Our waiter, Lee, was fantastic. The decor is gorgeous, the food was delicious, and the drinks expertly crafted. The only complaint is that it took a VERY long time to get our food. Granted, the restaurant is new and it was totally slammed on a Tuesday so the kitchen might have been short handed or overwhelmed. I will definitely come back. A little too noisey but the food was great. Service was great! Wonderful new restaurant in the French Quarter! Service was excellent. Food fantastic! 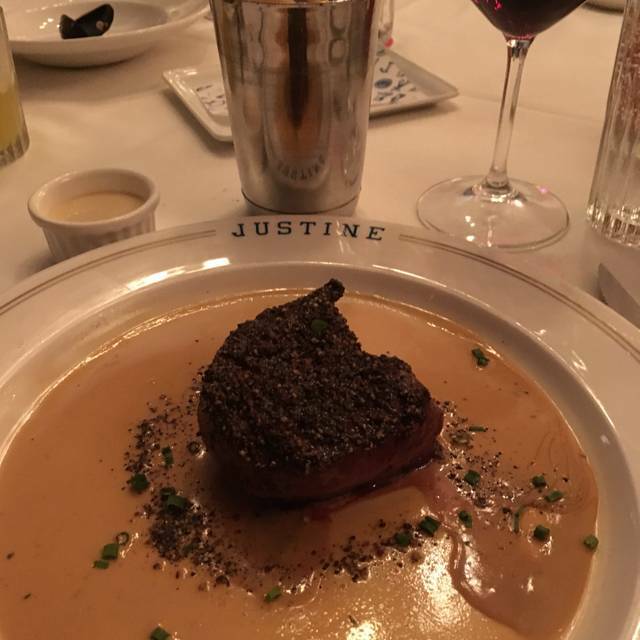 Always love dining and bringing clients to experience Justine. Especially when Robbie is there! He is an Oh so talented Maitre D and a great ambassador for NOLA. If I had to pick two things I would work on....I would have a separate lunch menu with more accessible pricing...And perhaps a happy hour of some sort. 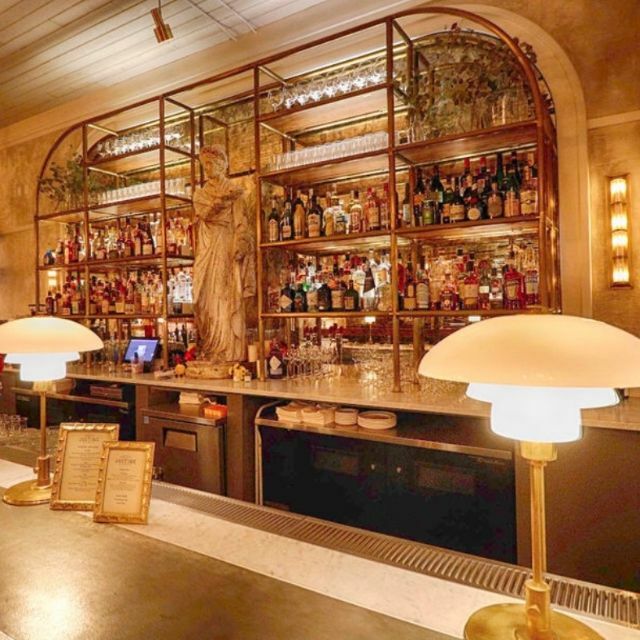 As a person who sells NOLA all day long to meetings and convention groups and is constantly entertaining clients-- it would certainly help and I could frequent Justine way more often. I love the vibe, the food and the team, but a little pricey for lunch and portions are a little small. Very well done restaurant. Drinks are a little small (1 oz pours) Desserts are weak. Very nice entrees and apps. VERY noisy and hard to visit on tables of 5-6. I had heard good things about Justine and was not disappointed. One of the best recent dining experiences. Strongly recommend. Great vibe but very noisy! Food was excellent and good value all around except the dozen oysters (very small) for $38! We had a table facing the kitchen so we were able to see our food just sitting and waiting to be brought to us. The employees managing the food runners were completely unorganized causing our foos to sit and sit for a while. When it was delivered it was warm and not hot. We were never asked how our food was at all during the meal. To make matters worse, the restaurant was freezing. We complained and watched the manager shrug his shoulders. I will not be returning again. Poor service all around. 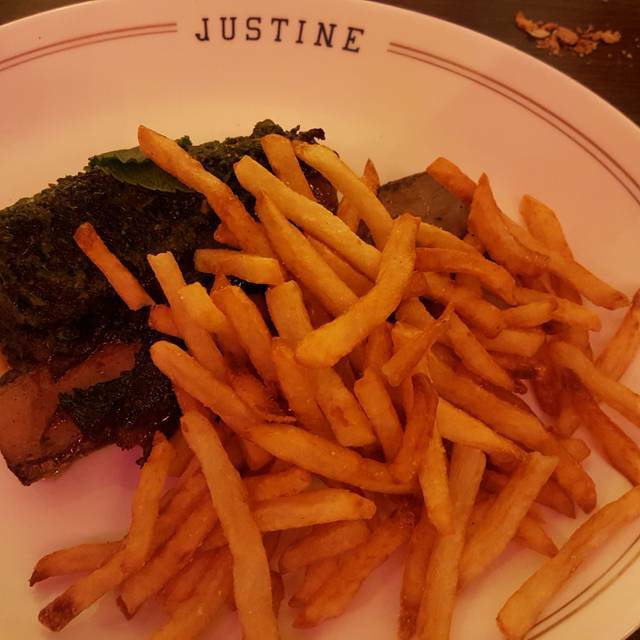 I visited Justine last Saturday for a dinner with 4 others. After reading all of the press and social media, we had high expectations for the meal. 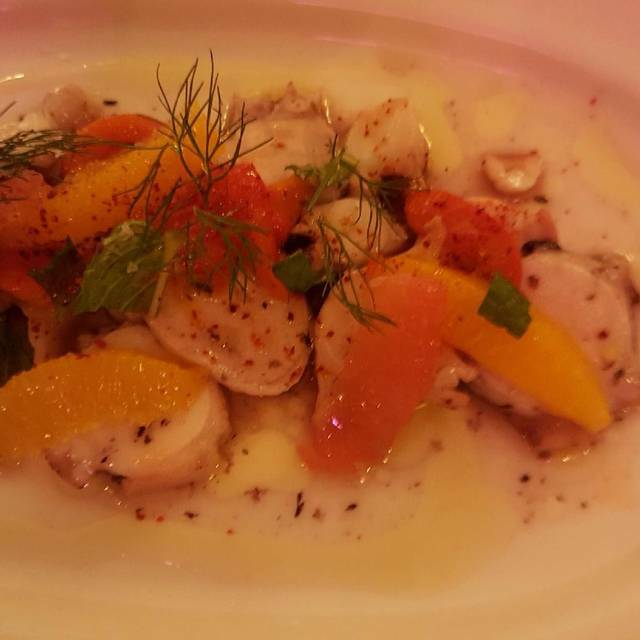 The grilled octopus and Felix Kir cocktail were wonderful! 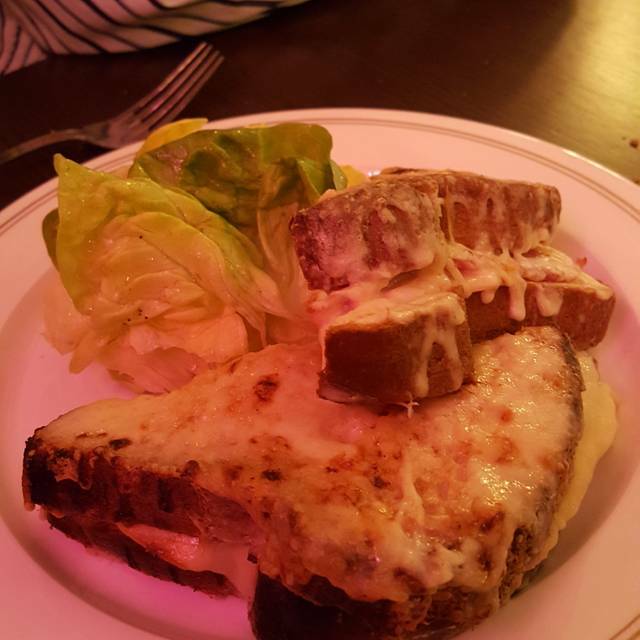 The prices were a bit high though and although the food was good (we really had no complaints), we weren't "wowed" by it (especially given the cost) and actually thought most of our dishes lacked the richness that is typical of French cuisine. I would dine at Justine again but not frequently. And, if I was in the mood for traditional French cooking, I would likely go elsewhere. Hands down the MOST FUN in the French Quarter! I can not say enough great things about this place. . . ambience, food, service, and all out fun!!! SSSShhhh! Great addition to French Quarter dining scene. Loved the menu and the decor. Will be back!! Justine has only been open for 3 months. It will soon be recognized as one of the best. Every phase from staffing, décor, food, all of it is absolutely as good as it gets. This is the best of new New Orleans. The old line will need to step up their game. Don't miss it. Went soon after the opening, something I don’t ordinarily do, but we met up with old friends, and had a wonderful evening. Excellent Sazarac, Offered with the original cognac as well as with Rye. Food was excellent, with innovative touches. The restaurant itself was gorgeous. Well done Justin! It’s my new favorite restaurant. Going again next week. Justine told Open Table that we were a no show. We arrived a little early, were seated at a high top. I'm less than 5 ft and 72 yrs old. There were empty tables with regular chairs. I asked if we could have a table rather an a high top and we were refused. Open Table was going to contact Justine so that I would not be in the system as a no show. Haven't heard back from Justine or Open Table. Very disappointed. Birthday dinner... no recognition of birthday but received great service and wonderful food. I reserved thru open table. I was surprised to be offered a table on the outside patio. When I asked to be seated inside, they put me at a counter, even tho there were many open tables. I don’t like when restaurant staff are pretentious and here they were. The food was ok but nothing spectacular. Absolutely amazing from start to finish. Fun mix of vintage and modern interior design/concept and every bite of food was expertly prepared and presented. 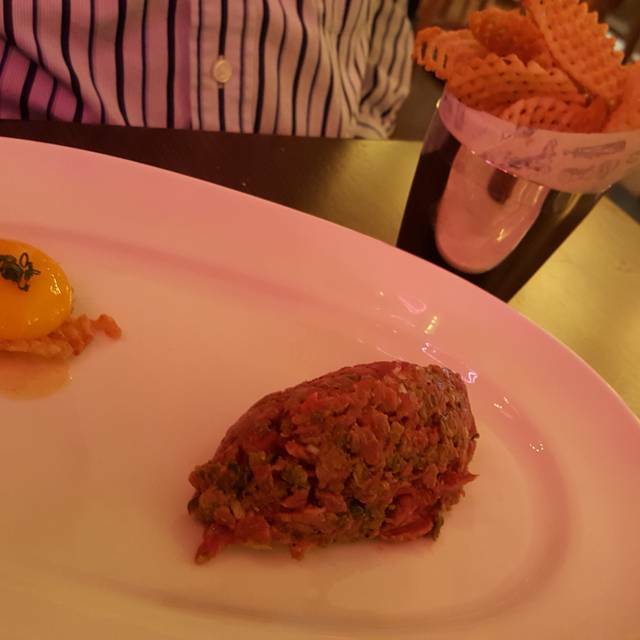 The Niçoise salad was not good. The egg was loose and runny. There were only 2 pieces of tuna the size of a quarter in the entire salad. The dressing was not tasty. We asked for additional dressing and it was a touch better. We live in New Orleans and we are used to delicious food. Normally a Niçoise salad has several large slices of tuna seared on the outside and reddish on the inside. This had a couple of quarter sized pieces that looked like cold smoked salmon. The hostess was blah. Tuesday’s special - the Lobster Raviolo is amazing! Perfect size portion to leave room for there decadent desserts. If you have the time, make sure to try Justine’s. Mixed review. My wife had the duck and it was a bit dry and not a great dish. 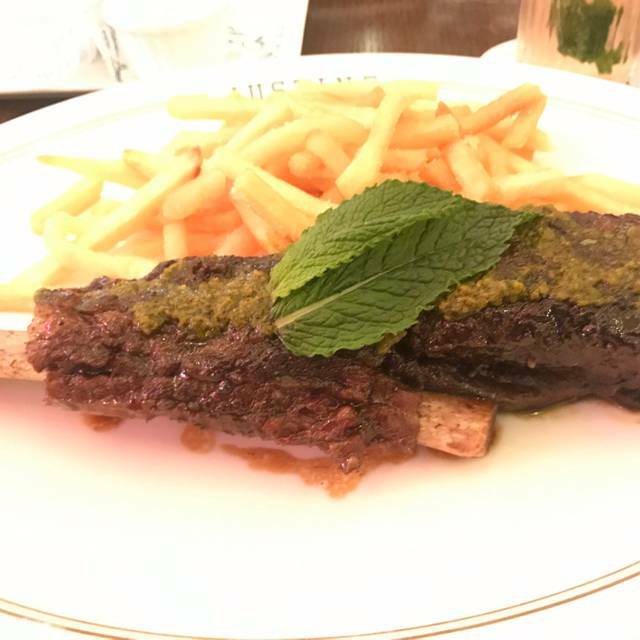 I had the short rib which was done very well. The server was nice, but unorganized. I like to order a drink and have it prior to eating, and while we sit and have a conversation. I had to ask twice, and then he brought the incorrect drink. He didn't come back, so I was forced to go to the bar myself and remedy the situation. Bar staff was nice, efficient, and there was no wait (which tells me the waiter was just not on the ball). 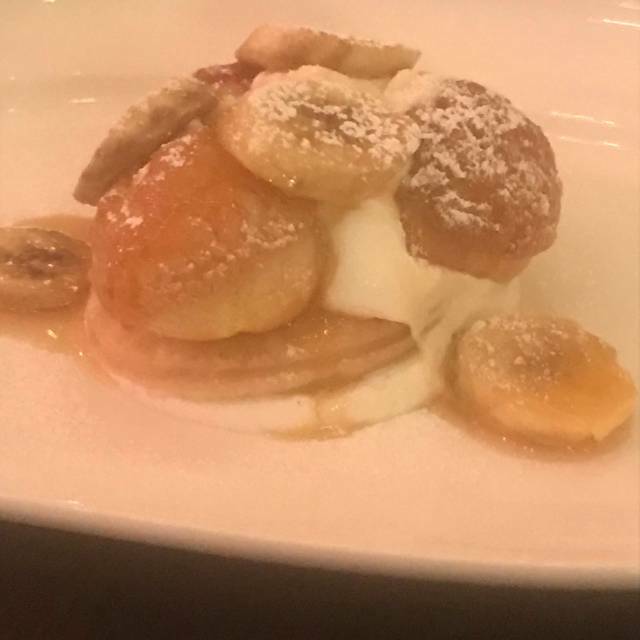 Great new spot and I would definitely recommend Justine for a great and unique dining experience. The only negative is once the sun goes down they keep the lights on full bright. Please DIM THE LIGHTS! Everyone and everything will look sooo much better! Delicious food and great space. Service was spotty, and quirky. Strange “fan” dancer appears during meal, I hear regularly. Don’t sit next to big table as guests can overpower your smaller group. The interior design is spectacular, especially the mosaics in the back dining room. We came for an early dinner so were well treated by multiple available staff. We were very dissapointed by the customer service we received. The hostess and lady bartender were quite rude and not at all what we expected from a place like Justine. Perhaps the staff needs to attend some “how to treat your customers” courses. If you want them to come back that is. The food was good and the atmosphere cool. However, our party of 6 wouldnt go back anytime soon. Great experience and great food! Definitely recommend! Music was very loud and the type that was played detracted from the ambiance and made me feel like finishing my meal and leaving rather than lingering. Tuna was undercooked and barely warm. Service was slow. Food was good, but not over the top. Our coffee was lukewarm, the food portions were small and overpriced for what we got. The shrimp we ordered was over cooked. The server was very curt and unhelpful. Best ambiance in the city. Beautiful decor, good food, great service. I enjoyed my lobster terrine appetizer, my small Boston bib salad, and mussels and fries. My husband had the onion soup, which was a little bland. It needed more beef flavor and the prime rib, the Saturday special. It was undercooked(rare) but we sent back and came back fine. The service at the bar and at the table were terrific. Loved the burlesque ladies walking through out the restaurant too. Will definitely be back.